Seasoning is an essential process that must be undertaken with all wooden humidors. As the wood of new humidors is quite dry, it will need to absorb moisture before the humidor can safely and effectively store cigars. Why Season A Wooden Humidor? When Should You Season A Wooden Humidor? Even some experienced cigar smokers sometimes may wonder why it’s necessary to even season a wooden humidor in the first place. Surely if there’s a humidification device, that should be enough to ensure a stable relatively humidity (RH) inside. Unfortunately, wooden humidors aren’t quite as simple as acrylic humidors or tupperdors. However, they do indeed have their own benefits, which you can learn about in our main wooden humidor guide. While acrylic humidors and tupperdors are theoretically non-porous barriers, wood is a natural material that absorbs moisture. This is actually one of their key benefits as we mention in the guide linked above as the wood acts as a membrane. Much like the limestone subsoil in tobacco or wine-growing regions, the wood will absorb excess moisture and then slowly release it when the environment dries. This natural property is highly beneficial as it can act as a buffer during sudden spikes or drops in humidity. Consequently, wood will absorb as much nearby moisture when dry. As such, it won’t just be ineffective when used for storing cigars because it absorbs all the moisture for the air. In fact, the wood may even absorb the cigars’ moisture and dry them out. Therefore, seasoning a wooden humidor ensures that the wood is properly hydrated and contains enough moisture for storing cigars. If executed correctly, it will provide all the aforementioned benefits without potentially absorbing any of the humidity produced by the humidifier. It is important to always season a new humidor as the wood has never been exposed to any moisture. For instance, most new wooden humidors are delivered with silica packs inside, which are designed to absorb moisture during transit and storage. As new wooden humidors are often bone dry, this will likely be the most intense seasoning process. Dry wood is able to absorb a considerable amount of moisture and you’ll be surprised by just how much water it can drink! A new humidor will need seasoning before its first use. However, it will also need to be seasoned once a year for the first four years thereafter. This is because new wood may be more zealous in releasing moisture than storing it. Therefore, regular seasoning ensures that the moisture penetrates deep into the wood. Older wooden humidors that haven’t been used for a long time will also need to be thoroughly seasoned as they’ll likely have lost a lot of moisture since their last use. Finally, you experience may any sudden and inexplicable drops in humidity with a wooden humidor at any given time. If you’re unable to bring it back up with new humidifiers, you may be experiencing what is known as a seasoning event. In short, this is when the wood in your humidor has begun to dry below a certain threshold and not be performing as well as it should. This phenomenon may simply be caused by a long-term lack of humidity or a sudden change in your local climate. They’re particularly common during certain seasonal changes but may require that the humidor is seasoned again. As you’ll learn below, there are many different ways to season a humidor. In our many years of smoking and collecting cigars, we’ve tried them all and experimented with various techniques. However, they tended to be messy and often resulted in varying degrees of success. We recently discovered a new method using Boveda’s 84% Seasoning Packs, which has proven to be reliable, consistent and hassle-free. 1 x 60g 84% Boveda Seasoning Pack per 25-cigar count. 1 x 320g 84% Boveda Seasoning Pack per per cubic foot of storage. A One-Year Boveda Bag if you need to store your cigars elsewhere. You’ll unlikely need to use both the 320g and 60g pack sizes. As such, learn which ones are most adapted to your humidor with the following section. How Many Seasoning Packs Will You Need? You’ll need the right size and quantity of seasoning packs to proceed. They packs are available in sizes of 8 grams, 60 grams or 320 grams. While the 8 gram packs may be useful for some cedar-lined travel humidors, they’re generally too small to provide enough humidity for seasoning. Meanwhile, the 60-gram seasoning packs are suitable for most desktop humidors. Simply add one pack per 25 cigars of the humidor’s total capacity. Therefore, a 100-count humidor will need four packs. For larger humidors or cigar cabinets, consider the 320-gram packs as they provide enough moisture for a cubic foot of storage space. Finally, bear in mind that unlike other types of Boveda humidity packs, it is possible to over-humidify with the seasoning packs. This can cause the wood to swell and potentially crack. Therefore, be sure to use the correct amount for no longer than the time stated below. 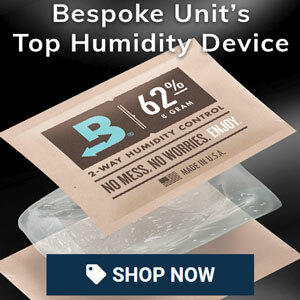 Before you begin, note that this only works with Boveda’s 84% humidity packs. Packs with lower RH levels won’t produce enough moisture to be absorbed by the wood. Firstly, you’ll need to make sure that the humidor is empty of any cigars. However, keep all the shelves and separators inside the humidor so they can be seasoned too. If you are seasoning an older humidor or already have cigars, we recommend that you use a One-Year Boveda Bag as a temporary storage solution. Next, remove the seasoning packs from they plastic wrapping and place them evenly inside the humidor. If using a single pack, place it somewhere close to the centre. Unlike other seasoning methods, you don’t need to place the packs on another materials as there is no risk of the wood below it absorbing too much moisture. Instead, the packs’ 2-way membrane will diffuse moisture evenly throughout the humidor. Now that the packs have been securely placed, simply close the lid and leave the humidor for a period of 14 days. Any less and the wood may not have absorbed enough moisture. Meanwhile, leaving them too long may cause the wood to absorb too much. Once two weeks have elapsed, simply discard the seasoning packs and replace them with the humidifier of your choice. As the seasoning packs provide 84% relative humidity, they will be too high for cigar storage. However, they’ll unlikely be able to be used for seasoning again as they will have become too dry. Your humidor is now seasoned and ready to store cigars. The first and most obvious benefit of seasoning a humidor with Boveda is that the method is effectively foolproof and easy to do. There’s no mess and you don’t have to spend your time meticulously rubbing down the interior of your humidor with a sponge. However, the most significant benefit is that the seasoning process is far more effective. Rather than just wetting the surface, the seasoning packs provide an intense and prolonged exposure to moisture. On average, the most common wipe-down method explained below only distributes a mere 2 grams of moisture in a wooden humidor. Meanwhile, the Boveda packs will provide between 70 and 120 grams of moisture. The result is deeper moisture absorption by the wood, which provides a prolonged and thorough seasoning for your humidor. Therefore, you’ll unlikely see any drops in humidity after adding your cigars. Of course, no method is perfect. Seasoning your humidor with Boveda takes slightly longer than the other methods. Most people recommend a seasoning process that lasts around 3-days. However, as mentioned above, it doesn’t ultimately provide near as much moisture. Furthermore, Boveda seasoning packs aren’t as cheap as the household objects that you’ll use for the other methods. Nevertheless, they’re no more expensive than the regular humidity packs that you may use on a regular basis. As previously mentioned, there are dozens of way that you can season a humidor. While they do work, we’ve not found them to be nearly as effective as our preferred method. Nevertheless, this section of our guide will walk you through the other ways to season a humidor. Typically, a humidor is seasoned using both methods that we’ll describe. However, sometimes just one is used for older humidors that need a quick pick-me-up. There are also humidor wipes that are specifically made for seasoning humidors. While they’re more expensive, you may find them to be quite convenient. Be sure to only use distilled water when wiping down your humidor. While tap water contains chemicals that may harm your wood or cigars, spring water consists of minerals that may not do it any favours either. Furthermore, we recommend using PVA sponges for this procedure. PVA (Polyvinyl Alcohol) synthetic material mimics the natural sea sponge. As it’s far denser than common household cellulose sponges, it absorbs more water. This results in better control when wiping down the humidor. Finally, only use a clean sponge as a used one may contain chemicals or smells that will affect the humidor. Begin by filling a glass bowl with distilled water and use it to dampen your sponge. If you’re using a regular sponge, be careful not to wet it completely as you don’t want to add too much water to the humidor. Next, proceed to wipe down all the cedar inside your humidor. Make sure that you wipe down all the separators and shelving as well as the seals lips in the lid. Take care not to over-saturate your humidor and refrain from pouring it in. Instead, use enough to see a very clear and visible colour change in the cedar. When it’s as dark as possible, you’ve added enough. Once you’ve wiped down all the nooks and crannies, place the sponge inside the humidor on top of a tupperware lid, some cellophane or plastic. Avoid applying it directly on the wood as as it may damage it. You’ll also need to add a calibrated hygrometer so you can monitor the relative humidity. Finally, close the lid and leave the humidor for 24 hours. Once this time has elapsed, repeat the process again. This time, take the sponge out before leaving the humidor for another 24 hours. After the second 24 hours are over, check the humidity using the hygrometer. If it is below 70%, consider repeating the process again. However, if it’s quite high, add your humidifiers and close it. Your humidor will be seasoned and ready to store cigars once the humidity has reached a stable RH level of between 65% and 70%. Similarly, avoid adding cigars until the visible dampness has subsided. The above method is probably one of the quickest ways to season a humidor as it can potentially take only 48 hours. Furthermore, it’s one of the oldest and most traditional ways to do it. While it’s the oldest method, it’s not necessarily the best. The wipe-down method can be particularly hard to get right, especially if it’s your first time. Firstly, it’s very easy to add too much or too little water. Adding too much water can cause a host of problems including being unable to open the humidor as the seals expand. It may also warp the wood and cause permanent damage to your humidor. Conversely, adding too little poses little risks but is generally ineffective and means that you’ll have to wait another 24 hours before being able to try again. As mentioned above, the wipe-down method tends to ultimately distribute only 2 grams of water inside a humidor. This small amount isn’t nearly enough to be absorbed by a wooden humidor and is overall ineffective. Consequently, you’ll potentially find yourself repeating the process for days on end. Remember that this is only the first step in seasoning a new humidor and you’ll have to use the next method to complete the process too. Furthermore, the wipe-down method is particularly messy. It’s easy to find yourself knocking over the glass or dripping water everywhere. While this isn’t necessarily disastrous, it’s inconvenient. Usually used to complement the wipe-down method, a bowl or glass of water is another old-school seasoning technique. In short, you use a glass of water to increase the internal humidity through a process of evaporation. Sometimes, this method will be used on its own if your humidor’s RH is dropping below desired levels. Yet, like all the other methods, it should be done with an empty humidor. As such, consider grabbing a One-Year Boveda Bag to preserve any cigars elsewhere. For this method, you don’t necessarily have to use water but can opt for a Propelyne Glycol solution instead. PG is a chemical that’s used in a lot of things like the base for vaping liquids and as well as anti-freeze. Although it sounds scary, PG is quite benign but has powerful evaporating properties, which is why you’ll often see it in humidification devices. You can even buy pure PG but you’ll need to mix it with distilled water for it to be effective. Additionally, remember that like the wipe-down method, you should only use distilled water for the same reasons. The water bowl method is as simple as it sounds. Simply place a glass filled with water or PG solution inside your humidor. Afterwards, add any shelves and separators on top. Before closing the humidor, add a calibrated hygrometer as well as your chosen humidifier. Once everything is inside your humidor, close it and leave it for three days. During this time, check the level of water or PG solution and top it up if necessary. This also applies to your humidifier if you use one that may require recharging. After the three days have elapsed, consult the hygrometer. If the RH registers at anything above 70%, you should be good. However, if it’s still too low, you’ll have to leave it for another few days. Once, your humidor has reached a stabled level, remove the bowl of water and add the cigars. Unlike the wipe-down method, this seasoning process is relatively easy and hard to mess up. The wipe-down method may damage the wood or distort the grain. Meanwhile, you avoid this risk as only moisture vapour rather than water comes into contact with the wood. Firstly, the extent of its effectiveness is largely dependent on the ambient temperature. If you keep the humidor somewhere cold, little water will actually evaporate and you’ll have to wait longer. However, using a PG solution may improve results. Nevertheless, the bowl of water method is generally not very effective. Although the Boveda Seasoning packs function using a similar principle, the membrane and internal solution renders it much more effective. In reality, very little water will actually find its way into the wood from the glass over the course of three days. You’ll likely have to wait longer for it to have any real effect. Furthermore, the bowl of water method isn’t very effective for larger humidors. The water that evaporates will unlikely diffuse very far from the bowl or glass and will only affect the immediate radius. While you could always use more, larger containers of water for larger humidors, it makes the process very inconvenient. Reviewed by Jimmy P., on 26th October . "Really helpful guide! I was sceptical at first but then delighted by the results of the best method for seasoning my humidor."